Last winter was warm and this has meant the Coho and Spring salmon we were holding in our pens at Marie Lake were eating and growing faster than normal. So the hatchery crew released larger and healthier fish than normal and this happened earlier too so we should get a good survival rate. This will ensure the survival of these runs of salmon in the island’s largest river. Ec Dev. Is negotiating to access more support funding from the sports fishing industry as the Coho we release are considered a boost to those fishermen. This will compliment our very slim budget from the Federal Government to run this hatchery. As always, it is only because of the dedication of our crew headed up by Rolly and Darren that this facility is even in existence. 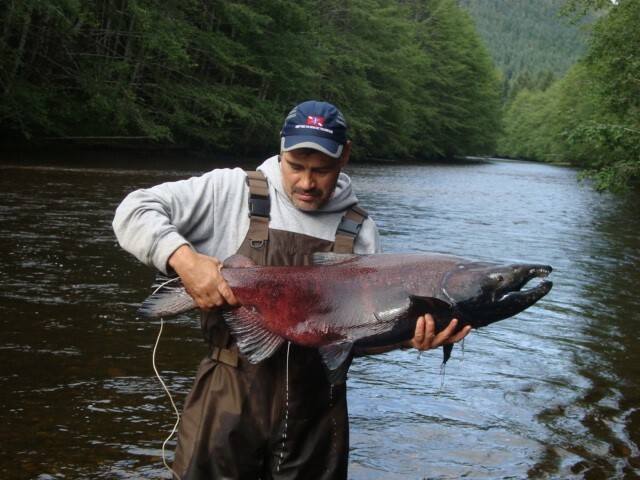 To address this funding shortfall we have formed “The Friends of Yakoun River Society”, whose sole purpose is to raise money to support the hatchery and make more salmon in the Yakoun and Mamin Rivers. This Society operates as its own entity at arms length from the Old Massett Village Council.